New analysis: Barnes explains why the plight of our middle class is now so dire that conventional policies will no longer save it. New solution: Barnes proposes a simple market-based way to provide supplemental income to all Americans. Economic inequality has become like the weather: everyone talks about it, but nobody knows what to do about it. Working Assets cofounder Peter Barnes has a plan: pay equal dividends to everyone from wealth we own together. Barnes argues that, thanks to automation, globalization, and winner-take-all capitalism, there will never again be enough high-paying jobs to sustain a large middle class. The only hope lies in nonlabor income—that is, in jobs plus something more. Building on our Declaration of Independence, an essay by Thomas Paine, and a thirty-year-old program in Alaska, Barnes proposes paying monthly dividends to every American. This supplemental income would come from assets we hold in common—the atmosphere, the natural world, our monetary system, and more. Such dividends would not only keep our economy humming but also make it unprofitable to abuse nature. 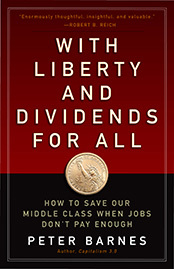 Barnes's proposal bypasses the current gridlock between left and right; once set up, the dividend system is purely market based. This work is a truly visionary yet eminently practical solution to a seemingly intractable problem.